Fundamental Analysis is the back bone of currency market analysis, and it is the key to trend formation on the chart of a currency pair. In the early age of trading, most of the traders do not focus and understand the importance of fundamental analysis in currency trading. They generally rely on the technical analysis, specially technical analysis indicators. Fundamental analysis is ,simply, the analysis of the domestic, international and geopolitical factors that effect the value of a currency. As an example, if we think about the fundamental analysis of USD, you have to study the domestic, international and geopolitical factors that effect the value of US dollar. Okay, now let me explain the dimensions of the fundamental analysis of a currency. Economic Overview: Studding the economy of a currency is crucial for the fundamental analysis of the currency. 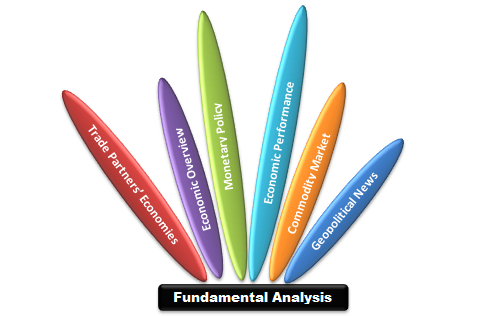 This will help a trader to understand the strengths and weakness of an economy, to know the major sectors that compose the large part of the GDP, to know the international trade and to know the domestic production and consumption scenario. Monetary Policy: Almost all traders who have taken a basic course on macroeconomics should know the effects of monetary policy on the economy and the goals of monetary policy. For the fundamental analysis of a currency the monetary policy of the corresponding nation has to be studied by the traders. Monetary policy is directly responsible for the appreciation and depreciation of a currency. Economic Performance: Economic performance of an economy is measured by the economic indicators, that are easily found. The most important economic indicators are GDP, CPI, PPI, PMI, trade balance, industrial production and manufacturing production etc. The importance of the economic indicators sometimes depends on the structure of the economy. Commodity Market: Commodity market plays significant role in the fundamental analysis of currency market. All currency pairs may not be affected by the commodity market, but the all major currency pairs are affected by the commodity market. If an economy is the producer or consumer of X commodity, the currency of that economy must be affected by the price of X commodity. For example Canadian Dollar is affected by the oil price because Canada is a net oil exporter. Geopolitical News: Every geopolitical news at least affects a single currency, some times a single geopolitical news can affect the whole currency market. In recent weeks, we observed how the USD was affected by the Iranian Nuclear Deal. A geopolitical news can directly affect a currency by increasing the risk for corresponding economy, or indirectly by effecting the commodity market. Furthermore, a currency can be indirectly affected by a geopolitical news, if the news affects the economy of the trading partner or partners of the economy of that currency. Trade Partners' Economies: This portion actually made the fundamental analysis of currency market more complex. When I first started to learn forex trading, I was completely blind to the effect of trade partners' economies on a currency. For me, It took couple of months to get introduced with this issue. When I discovered it, I found the partial answer of the FAQ "Why currency pairs are correlated". International trade is one of the reasons behind the correlation between currency pairs. Trade partners' economies determine the value of their currency, and trade partners currencies affect the international trade of a domestic currency. Trade partners' economic performances define the demand for the exported products by the domestic economy. Actually, for the fundamental analysis of a currency, traders have to conduct fundamental analysis on the all of the major trade partners' currencies. Dear traders, if you want to join the discussion with other traders, you can drop a comment below. You can also subscribe my blog to receive the updates from me directly into your inbox. Simply enter your email address into the subscription box on the right hand side. Thank you for reading my words. Great post... This blog provide all information on Forex fundamental which is very helpful for all Forex traders and specially for newbies.